RANGPUR: Jorna Begum along with her husband Belal Hossain, a poor farmer of Modhupur village in Kawnia upazila of Rangpur, left her flooded home on August 12. After staying on a flood protection embankment for several days, they returned home on August 29, but the receding floodwater had already eroded the soil from the floor, turning the house risky for living. We do not have the ability to repair the damaged house. We have to live here amid the threat of snakebite. Our Aman paddy on two bigha of land was also washed away by floodwater, Jorna, 40, said during this correspondent’s visit there a couple of days ago. Monir Mia, 50, a van puller hailing from Mohipur village of Gangachora, could not restore his house that collapsed due to the strong current of floodwater a couple of weeks ago. Monir, also a diabetic patient, could not manage proper foods, let alone insulin, during last three weeks. Now I cannot drive van for carrying passengers and goods as the flood damaged the village roads, Monir, said. Like Jorna and Monir, around four lakh flood victims in five upazilas of Rangpur district face crises after the receding of floodwater. 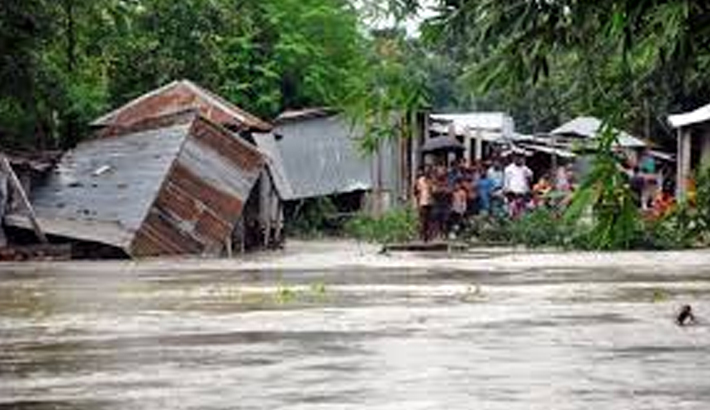 Floodwater washed away belongings of 93,334 flood hit families in five upazilas of the district. According to the district relief and rehabilitation office, a total of 7,548 houses were totally destroyed while 36,053 others partly damaged in five upazilas of the district as flood hit the areas early August and then again in mid August. We have got the list of flood damaged houses and an estimated Tk 101.94 crore rehabilitation fund is required for repairing the damaged houses. We have already submitted the report to the ministry concerned but the fund is yet to be sanctioned,” said Md. Kamal Hossian, district relief and rehabilitation officer. The floods caused extensive damage to roads and culverts, disrupting communication in 371villages of the five upazilas. A total of 286 km roads out of 162 kilometre concrete roads have been damaged due to the floods in Lalmonirhat. We have estimated the loss to be of Tk 113 crore,” said Zakiul Islam, Executive Engineer of LGED. Besides, 21 culverts were totally damaged, causing loss worth Tk 8.28 crore. The LGED has already submitted a letter for a Tk 122 crore rehabilitation fund to the ministry concerned that has allotted Tk 25 crore for urgent repair works,” he added.